GEEE Admit Card 2019: Galgotias Engineering Entrance Examination (GEEE-2019) is an entrance exam held at university level by Galgotias University (GU) for admission to the various streams of engineering & technology programme for the academic session 2019-20. This exam will be scheduled in the month of June. All interested and eligible aspirants can apply for this exam. Candidates who will apply for the GEEE must download the GEEE Hall Ticket to appear in the engineering entrance exam conducted by GU. Don’t forget to carry your admit card at the exam center on the day of examination. No one will be allowed to enter the examination hall or to give the exam without the hall ticket. Also, bring one of the valid ID proof i.e. voter ID card / Aadhaar card / PAN card. The university will issue the GUEEE Admit Card in the month of June, 1 week before the examination date. Candidates, who will successfully fill the application form and then submit it before the last date, can get their hall ticket in through online mode. Must download the admit card to appear in the GUEEE exam and keep it safe for future use also. It may be required in the counselling and admission process. The University will not send any admission letter to any candidate through any other medium. Therefore, the candidates can get their admit card through online process only. Sometimes, candidates are confused in search of an admit card link and they do not find the right link. 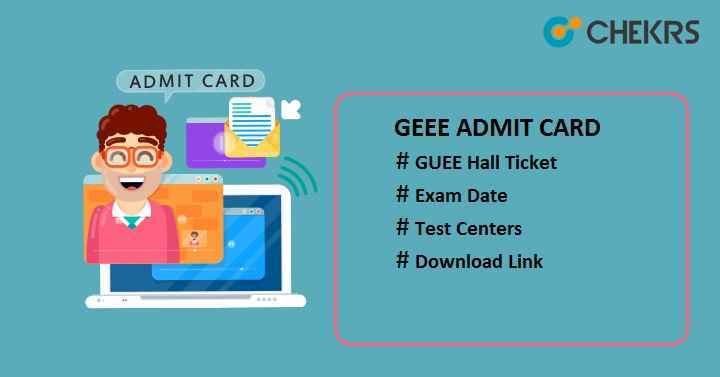 Therefore, we have provided the GEEE Admit Card 2019 Download link along with the downloading process here. Visit the official site of GEEE 2019. Search for the admit card link in the Latest News portal. Click on the link “GEEE – 2019 Admit Card”. It will redirect to the next page. Enter your user id and password to login into the candidate’s account.